Join Ben Curtis and Jason Reed from People’s Mortgage as they discuss ways to let your mortgage help you with cash flow. The two explore where interest rates come from, six indicators to predict mortgage rate movement, and why housing starts are so important. They also expose the 3 Cs that lenders look at when evaluating you for a loan. Join Andy Tanner, author of 401(k)aos and Stock Market Cash Flow, as he discusses his 4 pillars of investing that will help you on your path to financial freedom. Want to survive and prosper? Then you’re going to need cash flow. Only amateurs look to make their money through capital gains, real investors know that cash flow is the way. If you’d like to learn more about The Cash Flow Wealth Summit just click the link below! Andrew Lanoie from Real Asset Academy is today’s presenter, and his speech from the 2015 Cash Flow Summit takes a very deep look into real estate investing. Andrew covers his 5 Ps of real estate investing, what he looks for in a market, where he DOESN’T invest, the importance of meetups and more. Andrew also brings you a way to set up your real estate team to prime you for success in investing. It doesn’t matter how good your plan is if you don’t have the right people to implement it with you. Craig Ballantyne, author of The Perfect Day Formula: How to Own the Day and Control Your Life talks to you about dominating every, single, day! Craig shows you daily steps to build wealth, overcome distractions and focus on the things that truly matter in YOUR life. Craig explains the “5-Rules” you need to follow to have the “Perfect Day”. How can you overcome ANY problem in only 2-solutions? How can you conquer the chaos of life? How can you properly separate work and home life? In this episode of The Cash Flow Wealth Show, Jeff Schneider goes into detail about how he went from starting his first investments in real estate to becoming the President and CFO of the music-based company Royalty Exchange. Jeff breaks down how music royalties work and how YOU can use them as an investment! With the recent surge of online music streaming services, Royalty Exchange is disrupting the system and making investing in royalties easier than ever before! What’s the best way to invest into music royalties? How can you bring in passive income from the music industry? Connor Boyack, is the Founder / President of Libertas Institute and Author of The Tuttle Twins book series. 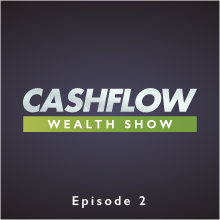 In this episode of The Cash Flow Wealth Show, Connor talks about the importance of teaching economics to young kids between the ages of 5 and 12 years old. He personally walks you through how he breaks down extremely complicated economic principles and transforms them into the engaging and compelling Tuttle Twins book that kids and adults can enjoy together! Nowadays, kids are more likely to be subjected to various political ideas due to the growth of social media. Connor shows you how to teach your kids strong and important economic values so that they can better understand the world around them.